Pamela Geller of Atlas Shrugs asks a good question. “Can you imagine, if you will, the leaders of a "white" country refusing to shake hands or walk through the same doors (as) the leaders of a "black" country?” I suppose the last year of any US Presidency is dedicated to legacy building and traditionally that means adding yet one more treaty to the history books. Of course, words on paper don’t mean anything if they leave the real world problems in place, but it does make a new bullet point on a resume. Caroline B. Glick: This week the Bush Administration legitimized Arab anti-Semitism. In an effort to please the Saudis and their Arab brothers, the Bush administration agreed to physically separate the Jews from the Arabs at the Annapolis conference in a manner that aligns with the apartheid policies of the Arab world which prohibit Israelis from setting foot on Arab soil. Israel's humiliated Foreign Minister did not receive support from her American counterpart. Secretary of State Condoleezza Rice, who spent her childhood years in the segregated American South, sided with the Arabs. Although polite enough to note that she doesn't support the slaughter of Israelis, she made no bones about the fact that her true sympathies lie with the racist Arabs. As she put it, "I know what it is like to hear that you cannot go on a road or through a checkpoint because you are a Palestinian. I understand the feeling of humiliation and powerlessness." Rice's remarks make clear that for the Secretary of State there is no difference between Israelis trying to defend themselves from a jihadist Palestinian society which supports the destruction of the Jewish state and bigoted white Southerners who oppressed African Americans because of the color of their skin. It is true that Israel has security concerns, but as far as Rice is concerned, the Palestinians are the innocent victims. It is amazing how far Condoleezza Rice has drifted out of the national spotlight. Three years ago she plays such a pivotal role in the Bush Administration the Aunt Jemima insults were flying from one side as calls for her candidacy arise from the base. Then about a year and a half ago, there is speculation Bush lost faith in his Secretary of State, and that breach has never fully healed. August 2006: The U.S. response to the Israeli-Hezbollah war was said to have divided both the administration as well as the family of President George W. Bush. At the same time, it marked the first time since Ms. Rice became secretary of state that the president has overruled her . "For the last 18 months, Condi was given nearly carte blanche in setting foreign policy guidelines," a senior government source familiar with the issue said. "All of a sudden, the president has a different opinion and he wants the last word." Maybe ‘APARTHEID is PEACE’ bumper stickers will start appearing on Madison motor vehicles next to the ‘COEXIST’ slogan. After all, this may be the best option for people wanting to avoid violence while leaving the ideological hatred intact. The Green Bay Packers come up short in Dallas tonight, losing by 10 points to the Cowboys. Over the next several days, the concern will not be about the loss of a road game to a very good football team, but whether the hit that knocks Brett Favre out of game in the second quarter is the streak ending blow. Aaron Rodgers comes in and plays a very good game in relief, but since the Packers have only two quarterbacks on the team, the question arises just who plays the position in an emergency. JS Online: Upon further review, these are the Packers players that have played quarterback in high school: CB Al Harris -- Don't think the right elbow is going to let him do it. LB A.J. Hawk -- Just imagine the possibilities. WR Ruvell Martin -- Maybe he can throw it to himself. Actually, he was a two-time all-conference and got all-state recognition as a QB at Muskegon (Mich.) Catholic Central. Might be the guy. Mike McCarthy keeps starting cornerback Charles Woodson out of the game and his absence as the director of the secondary is obvious all game long. Joining Woodson on the bench are Kabeer Gbaja-Biamila, Johnny Jolly and Aaron Rouse. If these four defenders are ready in the event of a rematch, the outcome may be different. A 10-2 record is something no one expected coming into this season and there is a lot of the season still to come. Washington Redskins Pro-Bowl Safety Sean Taylor is murdered in his home this week. Predictably, the government loves a disarmed public advocates, e.g. Rev. Jesse Jackson, call for increasing disarmament of the public as if that was the problem. Kansas City Star columnist Jason Whitlock, however, is willing to call it straight. Taylor's death a grim reminder for us all: No, we don't know for certain the circumstances surrounding Taylor's death. I could very well be proven wrong for engaging in this sort of aggressive speculation. But it's no different than if you saw a fat man fall to the ground clutching his chest. You'd assume a heart attack, and you'd know, no matter the cause, the man needed to lose weight. Well, when shots are fired and a black man hits the pavement, there's every statistical reason to believe another black man pulled the trigger. That's not some negative, unfair stereotype. It's a reality we've been living with, tolerating and rationalizing for far too long. … Let's cut through the bull(manure) and deal with reality. Black men are targets of black men. Period. Police Probe Taylor Death : A day earlier, Taylor and his girlfriend were awakened by loud noises, according to family friend Richard Sharpstein, who learned the details from Taylor's girlfriend, Jackie Garcia. Taylor told Garcia to get under the covers while he grabbed a machete that he kept for protection underneath his bed. Violent crime is about actions, not objects. Having a book full of gun laws and a machete under the mattress don’t mean a thing to armed thugs with malicious intent. CO2: The Greatest Scientific Scandal of Our Time: We thus find ourselves in the situation that the entire theory of man-made global warming—with its repercussions in science, and its important consequences for politics and the global economy—is based on ice core studies that provided a false picture of the atmospheric CO2 levels. Meanwhile, more than 90,000 direct measurements of CO2 in the atmosphere, carried out in America, Asia, and Europe between1812 and 1961, with excellent chemical methods (accuracy better than 3%), were arbitrarily rejected. These measurements had been published in 175 technical papers. For the past three decades, these well-known direct CO2 measurements, recently compiled and analyzed by Ernst-Georg Beck (Beck 2006a, Beck 2006b, Beck 2007), were completely ignored by climatologists—and not because they were wrong. Indeed, these measurements were made by several Nobel Prize winners, using the techniques that are standard textbook procedures in chemistry, biochemistry, botany, hygiene, medicine, nutrition, and ecology. The only reason for rejection was that these measurements did not fit the hypothesis of anthropo-genic climatic warming. I regard this as perhaps the greatest scientific scandal of our time. There is no danger. Don’t believe me. Believe the evidence. The Earth is safe. Healthcare. Competition. If only there was some way to see what would happen. Laissez Faire Medicine: What brings all this to mind is medical tourism. In the international marketplace a booming, bustling, vibrant, completely free market for medical care is emerging. Indeed, the words "free market" do not do it justice. It's as close to laissez faire capitalism as anything Adam Smith might have hoped for. And guess what? In this market, patients are getting information about price, quality, you name it - the very information no one can get back home. The reason: since almost all "medical tourists" pay with their own money, providers compete based on price and quality. By contrast, providers back home do not compete based on anything. Here's what's happening. Estimates vary, but as many as half a million Americans travel outside the United States for health care every year, and the number is growing by leaps and bounds. Amazingly, 70,000 British patients (who are supposed to be getting health care for free!) will leave the UK this year for health care abroad. These patients are going to such places as India, Thailand and Singapore, as well as countries south of our border. Americans are finding package prices (that may include airfare and hotel rooms) that are one-third, one-fourth or even one-fifth of what they would pay in the US. Virtually every major US insurer is actively studying how to enter this international market. But what about the poor? This is all about money. Exactly. Madison is ruled by believers in Smart Growth which is a marketing name for government planning. The movement, as it currently exists, tends to find justifications for restrictions on private property rights under the guise of saving the planet. Since the planet does not need saving, the Smart Growth bureaucratic machine should be understood as a growing danger to individual rights. IMHO. Cities Are Trading Places: “Public policy that reinforces autarky only makes matters worse,” economist William Bogart told the Preserving the American Dream conference. Which, naturally, provoked the question, “What is autarky?” The answer is that autarky means self-sufficiency, as in an economy that does not participate in international trade. Many planners are trying to make neighborhoods more self-sufficient by creating a “jobs-housing balance” and promoting mixes of residential and other uses. The ideal, in planners’ minds, is that everyone can find most of the things they want to buy or do close to where they live so they won’t have to drive long distances. One problem with this ideal is that competition is an essential factor in ensuring that businesses serve consumers. If we all shop only at the stores nearest to us, that competition is gone and the stores will lose their edge. Anything that restricts that competition — congestion, restrictions on where businesses can locate, ordinances prohibiting chain stores — reduces the health of urban areas and the economy. What a concept. Competition is good for consumer efficiencies within the economy but may not be the best thing for efficiencies of government control over the economy. Many bloggers including Boots and Sabers notice a weird Thanksgiving Day event in Hong Kong. The Chinese suddenly deny permission for the American aircraft carrier Kitty Hawk to make a planned port stop, then reverse themselves a day later after it is too late to proceed with the plan. Los Angles Times: China's decision to block the U.S. Navy aircraft carrier Kitty Hawk from a long-planned Thanksgiving visit to Hong Kong, before relenting 24 hours later "on humanitarian grounds," had all the markings of a diplomatic slap in the face, analysts say. It just wasn't terribly clear whose face it was aimed at. … Pundits near and far sought to explain what appeared to be behind the Chinese government's blunt yet hazy message. Like a good chess move, the decision to deny docking rights may have been a positioning advance, threatening both the United States and the Chinese Communist Party. This theory, of course, depends on there being a third player in addition to the US military and the Chinese politicians. China Confidential: China's decision to block a US Navy aircraft carrier from a long-planned Thanksgiving visit to Hong Kong, before relenting 24 hours later "on humanitarian grounds," was a message from China's real rulers--the military--that they intend to vigorously oppose an announced US buildup of Taiwan's antimissile shield. The flip-flop was also directed at the Communist Party, whose power the PLA has supplanted, according to China Confidential analysts. The military engineered an embarrassing diplomatic incident to remind the party that the PLA has its priorities and red lines. A growing neo-Maoist faction in the military is worried that the inequality caused by the party's continuing commitment to Western-style consumerism, coastal city development at the expense of the restive, left-behind countryside, and massive urbanization is ultimately unsustainable and likely to lead to regime-threatening popular uprisings--perhaps, even, a civil war--which the PLA will have to put down at great cost. China is too populous a nation to expect rivalries for power don’t exist. Under reported in the western press is the story of the Chinese politicians passing private property rights earlier this year. [*] This legislative move effectively guts the Marxist ideology from the law of land and it passes despite very strong traditional opposition. The disruptive effects of modernization and adoption of western style methods of producing prosperity are playing out in China as much as in the Islamic world. I have always admired Donald Rumsfeld. I’ve not always agreed with every detail but I respect his willingness to be truthfully blunt. Seriously, compare his candor to any of the individuals wanting to be President and spending hours working out how to be simultaneously non-committal and inoffensive. Rummy always speaks the truth as he understands it and if people get offended, so be it. His first public speech since the offended minions pressure him from office is worth the read. Remarks by Donald H. Rumsfeld: Thoughtful people do not relish the prospect of conflict. Indeed, Americans have assumed the responsibilities of global leadership more reluctantly than any people in history. Today is no different. But the challenges and threats in clear view now - in Iraq, in Afghanistan, and elsewhere - cannot be ignored, wished away, or turned from any more today than in 1946. These enemies have learned a crucial lesson about warfare in the 21st century - a lesson others seem slow in understanding. Today's conflicts are not only won on the battlefield, but through the use of websites and blogs, over the airwaves and on the front pages of our newspapers. Through skillful propaganda operations, the enemy successfully leverages their asymmetric attacks to encourage potential recruits to join their violent cause and to try to convince those of us in free nations to give in to hopelessness, self-doubt and despair. Their decentralized networks have been able to effectively employ the tools of the Information Age, while the U.S. government remains ponderous, muscle-bound and unable to respond in real time to the deceits of these enemies. … However valuable in the past, the institutions of the post-World War II period - Industrial Age institutions - have not adapted sufficiently to keep pace with the decentralized networks of the thinking enemies we face today, now well into the Information Age. It is, to be sure, easy to give in to the pessimism and cynicism of the day - to sit on the sidelines and criticize. It seems that in today's society, it can even be fashionable to blame ourselves. But, contending that America and her allies are the source of the world's problems - that it is America that has brought terrorist attacks on our country - is as reckless and ill-founded today as it has been in the past. The decision facing America and the world's democracies in the months and years ahead is the choice between acknowledging the determination of those who choose to be our enemies and treating them as they have chosen to be treated - or leaving them free to fight another day, at any place and time of their choosing. A thousand years from now, Rummy will be several paragraphs in the standard history of the dawn of the Information Age. Nancy Pelosi will be a footnote and Cindy Sheehan not even that. The Green Bay Packers 37-26 victory over the Detroit Lions moves them to 10-1 for the season. There are lots of stories in the GB Game 11 Stats but what strikes me is the tone in Brett Favre’s voice in the post-game interview. The exuberance in his face that the cameras catch during the course of the game is absent. The big smiles as he completes a personal and team record 20 straight completions are gone. Instead there is a reserved and reflective veteran player cautiously picking his words as he speaks on record. Pressed for a statement about the quality of this team he simply says, “I consider us lucky, I consider us pretty good, umh, I consider us kind of an unknown”. You can sense Favre is weighing the balance between lucky and good in his mind and perhaps for the first time wondering if there is enough discipline and talent in this team to be better than Dallas. It’s those unknowns that keep pushing optimism back into place. He has been this far up the difficult path to the Championship before. He understands the seriousness of purpose required to reach that goal and how far away he is from the finish. Some sort of confidence trigger appears to get switched on in the Halloween week Monday Night overtime win at Denver. The phenomenal 82 yard TD pass ending that game is only the 19th point of the night, and the fourth game in a row where the Packers score 23 points or less. Over the subsequent four games the team puts 33, 34, 31 and 37 points on the board as the offense begins to perform consistently. The Green Bay Press Gazette message boards dare to use the “P” word. Tom Pelissero: Favre is sold on this team. Even when he smirks and says they're "not bad," c'mon, they're 10-1. Favre is not a guy who is going to broadcast to the nation that he thinks his young squad can challenge the Patriots. And going into a game like Thursday's showdown in Big D, this team needs to embrace the underdog mentality, not go through the week with bravado. The team has the expected damage that comes from playing a collision sport and nothing in the future is guaranteed or predictable. Yet as the Packers head home for Thanksgiving night, they have every right to believe they are legitimate contenders to be the best of this season. That’s both a delightful and sobering thought. The first snow of the coming winter falls over Madison as the Thanksgiving Holiday begins. As the sun goes down, however, the power is on, the house is warm and there is plenty for everyone to eat. The Milwaukee Bucks beat the Los Angles Lakers. Life could be very much worse. Kims' Clear-Cutting of Korean Forests Risks Triggering Famine In some parts of the world, floods and famine are acts of God. In North Korea, they're acts of government. For decades, the late North Korean dictator Kim Il Sung mobilized vast work teams to fell trees and turn the mountainsides into farmland, allowing rainwater to wreck roads, power lines and agricultural fields. Following Kim's death in 1994 -- just before a flood- linked famine gripped the nation -- his son and successor Kim Jong Il continued the sacrifice of forest cover until 2000, when he began encouraging reforestation. But the shift hasn't reversed the damage, and some analysts warn that another famine, close to the scale of the 1990s disaster that may have killed millions of people, might occur as soon as next year. I suppose we are coexisting. I love this: “2007’s worst energy investment”. We’re talking moonshine. Factory made corn mash squeezings. The tasty liquid promising to quench our thirst and make us abandon our prior addictions in favor of alcohol. Oh, there are so many politicians still drinking from this well. I hope they spent their own money but they probably spent the pension funds. Ethanol Bust: Ethanol, the centerpiece of President George W. Bush's plan to wean the U.S. from oil, is 2007's worst energy investment. … Even worse for investors and the Bush administration, energy experts contend ethanol isn't reducing oil demand. Scientists at Cornell University say making the fuel uses more energy than it creates, while the National Research Council warns ethanol production threatens scarce water supplies. As oil nears $100 a barrel, ethanol markets are so depressed that distilleries are shutting from Iowa to Germany. An investor who put $10 million into ethanol on Dec. 31 now has $7.5 million, a loss of 25 percent. Florida and Georgia have banned sales during the summer, when the fuel may evaporate and create smog. The federal government has 20 separate laws and incentives to boost ethanol use, and 49 states offer additional subsidies and supports, according to the Energy Department in Washington. Scientists question the wisdom of using ethanol. Stanford University researchers say ethanol, originally added to gasoline in the 1970s to reduce tailpipe emissions, does nothing to improve the environment. Someone has to keep saying this. Oil is not bad for the environment. Alternatives to oil, however, can be extremely bad for the biosphere. Of course, bad economics will never deter the environmentalists because it’s not about free market money, it’s about power over nature. The Greens will say the problem is not the concept but the implementation. So what if corn is a bust, fuel oil from the expanding deforestation diesel plantations will be the answer to saving the planet --- for the new human management team. Just a reminder, I still adhere to the belief that the phrase “scientific study” should be given equal weight with the phrase “movie review”. This is because there is a whole lot of experiment free research being presented as science. With this caveat, the following work of statistical data analysis finds some unconventional wisdom. The Weight Story No One Wants to Talk About: But in contrast to the cancer report, which received enormous and largely uncritical media attention, a new study about obesity by Katherine Flegal and colleagues from the Centers for Disease Control and the National Cancer Institute made few waves. Yet Flegal's quiet and careful study could do much to calm our growing national hysteria about obesity. Flegal used data from the National Health and Nutrition Examination Survey, which is a representative sample of the US population, to find the connections between being underweight, overweight and obese and cardiovascular disease (CVD), cancer and many other causes of death. The results are startling since they confound much of the received wisdom about being fat in America. Flegal discovered that being overweight (BMI's of 25-30) was not responsible for increased mortality. In fact for CVD, cancer and all other causes, being overweight actually increased one's chance of living longer. In total, overweight was associated with a total of 138, 281 fewer deaths. Being overweight is not likely to kill you. There is a big difference between using experiments to produce reproducible empirical data to exclude alternative explanations, and the statistical manipulation of assembled sets of measurements. These latter calculations yield only correlations and probabilities. So when this Center for Disease Control report finds their collection of recorded numbers to be more of a dull epic than a moralistic horror story, it sounds plausible to me. These conclusions are much more in line with my personal experience than the endless waves of exaggerated hysteria from people actively searching for bad news, because bad news is good for getting headlines and grant funding. The “Trap Game” concept is all the rage these days. The idea is that a superior team fails to prepare properly for an allegedly weaker opponent when their concentration is diluted with thoughts of other challenges. Because the Green Bay Packers are such a young group of men having such an unexpectedly victorious season, there is concern the Carolina Panthers may be able to come in Lambeau Field and spring the trap. Well, not this time. GB Game 10 Stats. One very sweet 31-17 Packers Victory. A successful football operation efficiently runs all three aspects of the game. The Packers special teams open the scoring when Tramon Williams fields a pooch punt and with the help of excellent downfield blocking, runs it back 94 yards for a touchdown. Things like this happen in football, but they are more likely to happen if the coaching staff is doing their work correctly. Mike McCarthy post game: (What happened on the pooch punt for touchdown?) It was something we practiced all week. Mike Stock felt that he has something on the alignment of the kicker. Tramon did a very good job fielding the ball. That's what happens. Both offense and defense play a nearly flawless first half and take a 21-3 lead into the locker room. When early in the third quarter, Donald Lee catches his second touchdown pass of the day, it appears the victory is safely secured. Then Vinny Testaverde leads Carolina on two touchdown drives. After the game the defensive players deny that complacency set in with the big lead. A.J. Hawk says “I wouldn’t say we relaxed at all, they just made some good plays”. Al Harris says at the end of games you “play black board defenses”. The head coach, however, notices some sloppiness. Mike McCarthy post game: (When you're up 28-3, is it hard to keep the team focused?) When you're up 28-3 we're just in a different situation. Football is all about situations, whether it's four-minute situations, two-minute situations, red zone, they're all parts of your training that come up. Four-minute offense is something you'd like to be in a lot. We need to do a better job of finishing the games. When you're up 28-3, we can learn from that experience to put the opponent away. There was some sloppiness in our play down the stretch that we can learn from. 28-3 to me is just another situation that you're involved in. If this season is demonstrating anything, it is the ability of the Packers coaching staff to correct flaws and game plan for opponents. 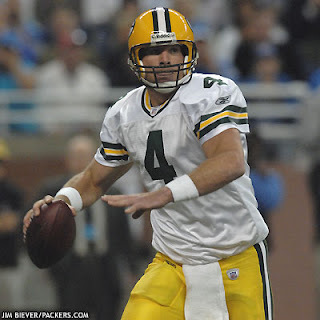 Brett Favre, after another 3 TD passing day victory, says he is “just riding the wave”. The team is 9-1 in this very special season, so enjoy the moment. Venezuela is becoming yet another example of how popular voting alone, without the restraints of a republic structure, can bring a autocrat to power who then destroys the democratic system. Hugo Chavez is a few weeks away from a constitutional rewrite that will allow him to rule for life. The Washington Post uses the coup word. Mr. Chavez's Coup: In fact, Mr. Chavez's rewrite would complete his transformation into an autocrat. It would lengthen his presidential term from six to seven years and remove the current limit of two terms, allowing him to serve indefinitely. He would have broad powers to seize property, to dispose of Venezuela's foreign exchange reserves, to impose central government rule on local jurisdictions and to declare indefinite states of emergency under which due process and freedom of information would be suspended. The Chavistas are activated and out in force to make sure the vote returns the results the boss wants. Chavez continues to justify his consolidation of power in the rhetoric of social justice. Psychologically, he needs massive public validation and it shows in his desire to let children vote for him. It is manifest in his fear that the public may refuse to participate his final assault on the traditions of his country. Momentum Builds in Support of Venezuela’s Constitutional Reform: Addressing the crowd, Chavez said that the key objective of the reform, "is to give more power to the people." He pointed to a proposed change to Article 64, which would lower the voting age from 18 to 16, saying "This proposal will open participation to more than two million people; two million youths of 16 years of age will have the ability to vote." Chavez also reiterated his call to all Venezuelans to participate in the referendum in order to defeat abstention. "We must work very hard in the socialist battalions, the commands of the campaign, the militants in the revolutionary parties, the students, the campesinos, the workers, the women, the indigenous all of us must work to reduce abstention," he said. The insult of abstention is glaring tell. Like the elections in so many tyrannies, there is a need for near unanimous public affirmation. As detailed in The Systematic Annihilation of the Right to Vote in Venezuela, there are questions about the legitimacy of past elections. If large numbers of citizens simply refuse to vote because they believe the game is rigged, it is likely to infuriate an ego maniac like Chavez who believes he is the savior of his country. Legitimate science is the process of ruling out options. In order to say the warming observations are caused by human activity, you need to start with statements like the warming changes can not have been caused by the sun and the warming changes can not have been caused ocean circulation. Skipping those steps is essentially abandoning the scientific method. NASA Sees Arctic Ocean Circulation Do an About-Face: A team of NASA and university scientists has detected an ongoing reversal in Arctic Ocean circulation triggered by atmospheric circulation changes that vary on decade-long time scales. The results suggest not all the large changes seen in Arctic climate in recent years are a result of long-term trends associated with global warming. Abbas Milani writes an excellent concise history of Iran since WWII as the essential backdrop to understanding the present acendency of Mahmoud Ahmadinejad. This is the most restrained overview of the situation in Iran I have come across in an overtly liberal publication. Milani is clearly attempting to present an accurate description of a complex historical society reacting to the forces of a modernizing world. It is good reading for anyone wanting more than a simple headline understanding of the Islamic Republic. Boston Review: With the Cold War raging and concern about oil supplies on the rise, the Eisenhower administration worried that the Shah’s repressive regime would incite a social revolution. The resulting pressure to liberalize, which mounted during the Kennedy years, compelled the Shah to introduce a series of socioeconomic reforms collectively known as the White Revolution (“white” for its supposed nonviolent nature). Like millions drawn to the city during those years, the Ahmadinejad family settled in one of Tehran’s poorest neighborhoods and brought with them the cultural conservatism and traditional Islam of Iran’s peasantry. Struggling to make a living through odd jobs, the elder Ahmadinejad continued to cultivate in his son an unbending devotion to Islam. Even by the standards of other villagers, the family was unusually devout. Ahmadinejad’s 2005 election, one of his chief lieutenants observed after the victory, was no “accident.” It was the result of “two years of complicated, multifaceted planning” by a coalition that included Revolutionary Guards commanders, a handful of clergy, some leaders of the Basiji (unhappy that the government had not yet given them jobs in the coveted civil service), and friends and allies of Ahmadinejad from his days as mayor of Tehran. This coalition was helped to victory by Ayatollah Khamenei. After taking office Ahmadinejad began a massive purge of the Iranian bureaucracy, installing allies in key positions. Ahmadinejad’s administration has rightly been called a “barracks regime,” with a majority of his cabinet officials and top managers coming from the ranks of the Revolutionary Guards and intelligence agencies. The size of this network of allies and supporters surprised nearly all observers and apparently even Khamenei himself. More importantly, Ahmadinejad not only made new appointments but tried to change the criteria for them, recalling the early days of the revolution when publicly demonstrated piety was the sole basis for appointment to key positions in government and the economy. The internal economy of Iran is in shambles and an extremely youthful population is absolutely aware of how their lives compare to the rest of the world. Milani ends with the iconic liberal call for “an offer of unconditional negotiations”. Given his convincing description of the oppressive state apparatus in place, it is hard to understand why he thinks trying to talk oppression away would help the Iranian people, much less the rest of the world. As much as the liberals hate the direct action in Iraq, those people are going to be living better lives long before their Persian neighbors. From the Climate Science Coalition: “Dr Vincent Gray, a member of the UN IPCC Expert Reviewers Panel since its inception, has written to Professor David Henderson, to support the latter’s call for a review of the IPCC and its procedures.” You can’t spell corruption without a U and N.
Review of the United Nations IPCC: Over the years, as I have learned more about the data and procedures of the IPCC I have found increasing opposition by them to providing explanations, until I have been forced to the conclusion that for significant parts of the work of the IPCC, the data collection and scientific methods employed are unsound. Resistance to all efforts to try and discuss or rectify these problems has convinced me that normal scientific procedures are not only rejected by the IPCC, but that this practice is endemic, and was part of the organisation from the very beginning. I therefore consider that the IPCC is fundamentally corrupt. The only "reform" I could envisage, would be its abolition. Remember, the “I” in IPCC is for InterGOVERNMENTal. DANEgerus has additional links to the scientific fraud of dangerous human created global warming. I understand that very intelligent people can be duped. I can forgive people being wrong. I have a much harder time forgiving people knowingly advocating lies in pursuit of wealth and power. The concept that the source of organic chemistry is detrimental to organic life is an extremely radical assertion. It’s the plausible story of con-men. It’s the diversion move of pickpockets. It’s the smokescreen of thieves. I am surprised the BBC is giving is a skeptic of catastrophic human induced global warming a platform. Perhaps when an actual climate researcher like John Christy starts calling for everyone to back down from the hyperbole, acknowledge the political contamination of research, and essentially get back to experimental testing of hypothesis, even the house organ of the British left begins to realize that globalwarmist alarmism has no basis in the fact. The quick bio from the BBC: "John R Christy is Professor and Director of the Earth System Science Center at the University of Alabama, Huntsville, US. He has contributed to all four major IPCC assessments, including acting as a Lead Author in 2001 and a Contributing Author in 2007." It sounds like the teacher is calling on the class to behave. No consensus on IPCC's level of ignorance: The IPCC is a framework around which hundreds of scientists and other participants are organised to mine the panoply of climate change literature to produce a synthesis of the most important and relevant findings. These findings are published every few years to help policymakers keep tabs on where the participants chosen for the IPCC believe the Earth's climate has been, where it is going, and what might be done to adapt to and/or even adjust the predicted outcome. Don't misunderstand me. Atmospheric carbon dioxide continues to increase due to the undisputed benefits that carbon-based energy brings to humanity. This increase will have some climate impact through CO2's radiation properties. However, fundamental knowledge is meagre here, and our own research indicates that alarming changes in the key observations are not occurring. My personal bias would change the phrase “continues to increase” which implies there is no upper limit that will be reached. The carbon cycle still exists and CO2 comes back out of the air and turns into maple leaves, sweet corn and other types of biomass. I would say: it appears the amount of carbon dioxide in the atmosphere appears to vary from hardly any to hardly any plus a smidge. If you know the results you want, you can design questions to get them. Take for example the 2007 Growth and Transportation Survey. The environmentalists are extremely good at propaganda. Survey says: "Three-fourths of Americans believe that being smarter about development and improving public transportation are better long-term solutions for reducing traffic congestion than building new roads". Yeah, I totally believe that number. Not. There may be a number of things that concern you about growth and development. I am now going to read you several aspects of growth, and after I read each one, please tell me how concerned you are about that particular aspect, that is to say are you STRONGLY CONCERNED, NOT-SO-STRONGLY, CONCERNED, ONLY A LITTLE CONCERNED OR NOT AT ALL CONCERNED. 9. Loss of open land such as fields, forests, and deserts. 14. Increase in highway commercial development such as strip malls. I am now going to read you several about growth, and after I read each one, please tell me whether you AGREE or DISAGREE with that statement. 19. Business and homes should be built closer together, so that stores and shops are within walking distance and don't require the use of an automobile. 20. New home construction should be limited in outlying areas and encouraged in very urban areas to shorten commutes and prevent more traffic congestion. And so on through the entire agenda. The environmentalists are serious about restricting your ability to drive, limiting the where and how you can live, and abrogating any property rights that conflict with their concept of how humans and nature should interact. Smart Growth is anti-freedom. Hat Tip to Dave Cieslewicz & Friends. The final numbers are: Green Bay Packers 34, Minnesota Vikings 0, but the game isn’t as close as that. GB Game 9 Stats. The combination of the Packers efficient ball control offense and shut down defense yields a time of possession differential more than two to one in favor of the Pack. Purple inclined pundits will find reasons to excuse the performance but the truth is Mike McCarthy’s utilization of Ted Thompson’s personnel is producing an elite team. Consider this angle, the Vikings achieve only 11 first downs all game and the Packers commit only four penalties all game: two false starts, an illegal block on a return and a late roughing the passer call. Noticeably absent are the pass interference infractions haunting the secondary the last several weeks. Now admittedly former Wisconsin QB Brooks Bollinger doesn’t instill fear into pro cornerbacks, but even conceding that fact, it is deep into the 3rd Quarter before he connects with anyone other than a running back. Whatever curse has been visited upon Minnesota, it manifests itself in one extended 4th Quarter sequence. The Vikings finally manage a drive deep into Packers territory only to have it end abruptly when Charles Woodson intercepts Bollinger at the 2 yard line. 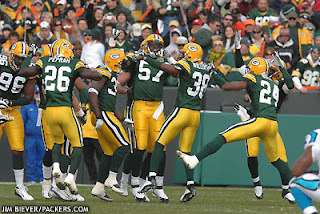 96 yards back the other direction Favre flips up a completely interceptable end zone toss that bounces off the hands of two Viking defenders and over to Ruvell Martin who catches it for a Packers score. The dominance is so complete that Aaron Rogers gets to walk on the field with a game clock running and pad his stats with a 102.1 quarterback rating. Two for Two baby for seventeen yards. Of course, he is charged for minus one rushing yards on two victory formation kneel downs. 8-1 and improving. Yeah Cheese! Did Putin Feel The Fear? Three weeks ago, Russian President Vladimir Putin drops by Tehran for a little face to face time with the Iranian leadership. At the time, the speculation was that Russia wanted to strengthen relationships with the Islamic Republic to insure Russia remains a world player as the world continues to try and figure out how to deal with the Mullahs. The usual photographs are taken, pledges of support are made in public then Vlad, the impish player, goes home. Asia Times 10/26/07: The barely reported highlight of Russian President Vladimir Putin's visit to Tehran for the Caspian Sea summit last week was a key face-to-face meeting with Supreme Leader Ayatollah Ali Khamenei. … In itself, the Putin-Khamenei meeting was extraordinary, because the Supreme Leader rarely receives foreign statesmen for closed talks, even one as crucial as Putin. The Russian president, according to the diplomatic source, told the Supreme Leader he may hold the ultimate solution regarding the endlessly controversial Iranian nuclear dossier. According to IRNA, the Supreme Leader, after stressing that the Iranian civilian nuclear program will continue unabated, said. "We will ponder your words and proposal." Shortly after the “Supreme Leader” agrees to ponder the infidel words, long time Iranian nuclear negotiator Ali Larijani resigns unexpectedly. For western diplomats, the devil they know is suddenly out of the mix. The New York Post publishes an article insinuating the Russians now want the West to know that Putin’s inner circle has concerns about the Iranian leadership after all. Mad Mullahs Puzzled Putin: In fact, the visit seems to have persuaded Putin and his closest advisers that the Tehran leadership is culturally and temperamentally incapable of playing the classical Cold War-style power games that the Russians are interested in. "This was the first time that Putin was talking to senior Islamic Republic leaders in a substantive and focused way," says a senior Russian official familiar with what happened. "The president found his Iranian interlocutor weird, to say the least. The Iranians mouthed a lot of eschatological nonsense and came close to urging Putin to convert to Islam. It was clear they lived in a world of their own." Russian sources say that both Ahmadinejad and "Supreme Guide" Ali Khamenei gave the impression that they settle matters "in the metaphysical space" and with "the help of the Hidden Imam." "The Iranians think they have already won," reports one Russian source who witnessed the visit. "So intoxicated they appeared with hubris that they did not even ask Putin to help them ward off further United Nations sanctions." The old Bolsheviks, secular pragmatists to the core, may have looked into eyes filled with messianic obsession for the very first time and emerged with a more adult understanding about the true dangers. It is precisely because the high priests of the hidden Imam aren’t playing world politics that makes them dangerous to the whole world. The vast majority of valid scientific work is brick laying. Following the trail of reproducible demonstrable observations and adding to the body of work. The theorists sketch out outlines but it is up to individuals, doing the piece by piece grunt work of observation and calculation, that either confirm or refute hypothesized ideas. Recently, the piece work in astronomy is confirming planets outside our solar system. This week researchers announce the first star with five confirmed planets. NASA: Researchers discovered the fifth planet using the Doppler technique, in which a planet's gravitational tug is detected by the wobble it produces in the parent star. … The newly discovered planet weighs about 45 times the mass of Earth and may be similar to Saturn in its composition and appearance. The planet is the fourth from 55 Cancri and completes one orbit every 260 days. Its location places the planet in the "habitable zone," a band around the star where the temperature would permit liquid water to pool on solid surfaces. This discovery is planet number 264 listed in The Extrasolar Planets Encyclopaedia. The star 55 Cancri is similar to the sun in terms of mass and radius, but very different in other ways such as heavy metal composition. It is also important to realize that the vast majority of planets being discovered around stars are giant gas balls like those from Saturn through Neptune. Part of the tingle of excitement with this discovery its presence in the “habitable zone” of the star. As outlined in The Search For Life Outside the Solar System, there are specific physical requirements for life and liquid water is the most important factor. Liquids are a transition state between gasses and solids and thus exist only when it is not too hot or not too cold. Everything in space is either extremely cold or extremely hot, except in the region near the fire where the extreme heat cools just enough for life enabling fluid solvency as the energy disperses out into the frigid void. In the above paper, there is a formula for calculating the distance a solid object needs to be from a star for the object to be in the temperature range of liquid water. That distance is between 0.1AU and 2.0 AU depending on the heat of the star. (One AU being the distance between Earth and the Sun). Astronomers know different stars produce different amounts of heat and there is variation in all uncontrolled combustion. Advocates for “The Global Warming Hoax”, claiming human activity adversely effects planetary temperature, ignore the role of heat in the CO2 - heat interaction. Their fixation on the carbon dioxide side of the reaction distorts perspective to the point of absurdity. Their obsession fails acknowledge the primacy of thermodynamics. Earth will never exceed habitable temperatures as long as our planet exists in the habitable zone. Our own Asian Badger points out the war on Islamic terrorism is a global war. Even as the American military is successfully eradicating killers for Allah from Iraq, the metastasis moves into any area willing to accept their presence. This includes South America were the message of submission is finding receptive audiences and more importantly, powerful protectors. If the Badgers beat Michigan Saturday does it salvage their season? This question is being kicked around on Madison sports talk radio and of course the answer is no. In hindsight, the expectations for this year’s team were probably way too high given the near perfect 2006 triumph. But many of us expected much more than what shows up. The convincing opening week victory over Washington State set the promise to the fans. Convincing wins over quality opponents. Over the subsequent three weeks, however, we all witness less than stellar outings. Our team doing just enough to squeak by lesser competition until the bottom falls out in Champaign, and they hit bottom in College Station. I will concede if the Badgers had been able to sustain their valiant effort at Ohio State and emerge victorious over a deservedly #1 ranked foe, then there would be a glorious conquest in this campaign to cherish. The kids played great in the Horseshoe but they were overmatched. This year the Badgers are a good team but not a great team. Now any victory over Michigan is great thing and I hope they beat the snot out of the visitors from east of the lake. They have a reasonable chance because this Michigan squad is not one of their finest vintages, and the many of the bucky boys remember the second half at the Big House last year. But beating the Wolverines won’t salvage the season because it won’t restore the hope for something special we had as the year begins. The United States military has been efficiently winning the war against Al-Qaeda in Iraq ever since the mid-term elections sent the message to Washington to either achieve victory or accept defeat. I’ve read the various Republican apologists making the case the Democratic victories a year ago were a response to failed promises or perceptions of corruption, but I don’t believe it. The media chose sides and chose defeat. Their influence served to convince enough voters that the good we are achieving is bad. The media's Iraq con job: The big con job the media has inflicted on the American people, by systematically distorting so many details about the conflict in Iraq, does more than skew politics back home; it makes Americans distrust the sources of their information and is an assault on democracy. Don't get me wrong. We need a critical press. Government, policy and soldiers should be scrutinized. The only question I ask the reader is: Who will hold the press responsible? I distinctly remember being taught to distrust common knowledge. Over time I have learned it is even more important to distrust individuals who believe they have uncommon insights. For several weeks now the wave of aggressive Islamic fundamentalism has been rising not in Turkey or Iraq, but rather in Pakistan with its vast interior border region of tribal primitivism. The danger inherent in Islamic terrorism has always been the fusion of a religious belief that God only values believers with technology capable of destroying unbelievers. I am in no position to evaluate whether the political maneuvers in Pakistan are good or bad, but I am sure the stakes of the game are very high. Pakistan: the perils of cutting expedient deals with lunatics: To cut to the bone, Pakistan is a rogue state selling nuclear technology and equipment to any government willing to purchase. Much of the story has been suppressed. But with the October publication of Deception: Pakistan, the United States, and the Secret Trade in Nuclear Weapons, it's harder to maintain the argument that if other governments (most notably China and the US) don't support Musharraf, Pakistan will be taken over by foaming Islamists who won't hesitate to deploy the Bomb. The real world is infinitely complex and it is impossible to foresee all future consequences of action or inaction. It is always possible to point to the trough in the waves that follow events through time. The critics of America’s efforts to contain and diminish Jihadist violence are very adept at pointing out the low points and I’m quite sure they take pride in their skill of the passive observation. I am not going green until green is cleaned of fake science and socialist authoritarianism. Remaining a conservationist suits me fine. Besides, the idea of clear cutting tropical forests to grow biodiesel because biodiesel helps save the planet is among the most stupid lines of reasoning I have ever heard. Speaking of intellectually vacuous stupidity, NBC places candles around their studio coverage of Sunday Night Football last night. It is some completely disingenuous example designed to show how we viewers should use less energy to be more eco-friendly. Meanwhile, the complex electronics required for a national television broadcast are all fully powered up and humming away. More importantly the advertising signs are brightly lit in the background. Self denial is one thing but ad revenue is another. You see General Electric, the parent company of NBC, is fully on board with green marketing as long they believe it will make money. And by make money they mean make money for the company as some GE workers point out. Screw That Bulb: Save the environment … or save a U.S. job? That’s the choice General Electric is forcing on U.S. consumers and its own workers. GE is promoting new, energy saving light bulbs known as compact fluorescents, or CFLs. These bulbs last longer and use less energy than the typical incandescent bulbs found in most U.S. homes – but can cost up to 10 times the price. GE is asking consumers and its employees to sign a pledge to “go green” and start purchasing the CFL light bulbs, which are imported from China. The problem is that each pledge leads to the loss of jobs in U.S. lighting plants. GE is actually asking workers in its lighting plants to pledge to put themselves out of a job! Let me be clear. The planet does not need saving. The planet is just fine. Stop watching television, go for a drive and observe for yourself. Nature is beautiful, healthy and thriving almost everywhere except maybe on the deforestation diesel plantations. And yes, it’s November, the leaves are supposed to be falling off the trees. It’s not a sign of the impending breakdown of the biosphere. The Green Bay Packers are trying really hard to show everyone they are a legitimate good team. For the second time in a week they go on the road to an AFC conference stadium and defeat the home team. Today is a 33-22 victory over Kansas City but the score does not truly indicate how close the game was. Like many long time Packer fans, I watch two first half drives stalling in the red zone and settling for field goals with a sense of frustration. I suppose all sincere fans follow their team with some mixture of hope, pride, fear and memory. 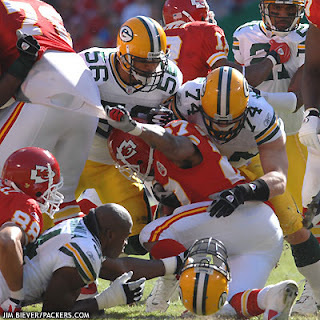 When Brett Favre throws his second interception and the Chiefs immediately turn it into a touchdown for a 7-6 halftime lead, the memories of all the bad Favre moments fire up in the synapses. Half a game of solid defensive effort nullified with one bad decision. Donald Lee plays a remarkable game and I suspect our Tight End is a bit tired of hearing about the greatness of Tony Gonzalez on the other side. Still, Gonzalez is as good as it gets at the position and when he takes yet another reception 17 yards for a go ahead score late in the 4th quarter the task of winning is suddenly slipping away. Of course, long time Packers fans understand good Favre is always a possibility. The next possession goes first down pass for 11 yards, first down pass for 11 yards, first down pass for no gain, second down pass for a 60 yard touchdown. Just another film clip for the Hall of Fame. Boom, Boom, click, Boom and three minutes left for the home team to rally. As much as Favre is getting the limelight for the highlights it is the defense Ted Thompson has put together cementing the victories. In May 2006 he signs veteran Cornerback Charles Woodson to a 7 year contract. Now as the clock runs down near one minute, Woodson steps in front of 3rd down throw to Priest Holmes and runs it back for 46 yard touchdown. The Packers head home with yet another road win and a 7-1 record half way through the year. For true fans, it’s going to be pins and needles the rest of the way and that is tremendous. The American Thinker posts another excellent article on why it is important to science to drive the globalwarmists from their midst. Just to be perfectly clear, detrimental man-made global warming is a false myth and those advocating this lie and for political, social and economic changes based on this lie need to be stopped. 'Global Warming' as Pathological Science: There is such a thing as pathological science. Science becomes unhealthy when its only real question --- "what is true?" --- is sabotaged by vested interests, by ideological Commissars, or even by grant-swinging scientists. Today's Global Warming campaign is endangering real, honest science. Global Warming superstition has become an international power grab, and good science suffers as a result. CO2 does not equal Heat so more CO2 does not equal more Heat. If the scientific community isn’t willing to assert this basic fact then the corruption is complete and we are all going to suffer the consequences of this un-true school of belief. The seductive lure of a command economy is the illusion that something useful is accomplished by administrative tinkering with price. I’m sure the central government in China went to sleep tonight believing they successfully addressed a problem troubling the country. China, Others in Asia Raise Gasoline Prices: China has increased gasoline and diesel prices for the first time in more than a year, as shortages disrupt transportation in the south of the country. … In southern China, long lines have formed at gas stations because of gasoline and diesel shortages. Some stations have had to shut down after certain oil refiners suspended operations due to rising crude oil costs. The reality is that supply and demand establishes actual prices and government interference only distorts the market in occasionally unbeneficial ways. This is not so say that everything is that everything is warm and snugly with the energy economy. Exxon Mobil helps trigger a massive sell off in the stock market with a profit miss. Exxon Mobil's quarterly net falls 10%: Exxon Mobil Corp.'s third-quarter profit fell 10%, its biggest year-over-year decline in three years, as the rising cost of crude-oil needed to supply its vast refining business outpaced the price the petroleum giant could fetch for its finished products. The socialists in the Democratic Party can believe “Big Oil” makes profit on demand but it ain’t true. There is a big difference between accumulating money via free exchange transactions and raising money by legal demand. The decision to move American toward either a healthier trade economy or an increasingly take and distribute economy is at the heart of all the politics this coming year. The Republicans at Red State are advocating a platform of positions they hope will capture the majority of voters in the elections a year from now. The energy “plank”, however, is simply retarded. Reagan 21: Be a Part of It: Energy: America must become Energy Independent to secure our nation and our economic future. Our policy initiatives include tax incentives for conservation and innovation in alternative fuel technology, environmentally responsible increase in domestic oil production, reducing cumbersome regulations, eliminating boutique fuels and building more refineries. What bloody rot. “Energy Independence” is the Democratic goal. They want this precisely because it insures a perpetual shortage which they can exploit for increasing government control over society. They want America in a position where a summer drought creates biofuel shortages so they can step in and save the day by setting price by fiat. What America needs is an energy policy that declares all the resources of the planet should be available for those willing to purchase them. The idea that America needs to be independent of the big bad scary world just strikes me as absurd.